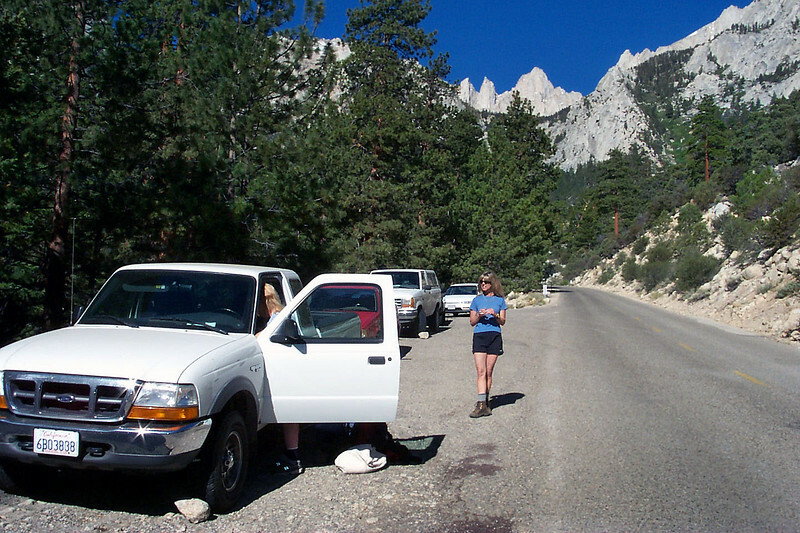 Kathy (in truck) and Sooz on the Whitney Portal Road, the start of our hike. 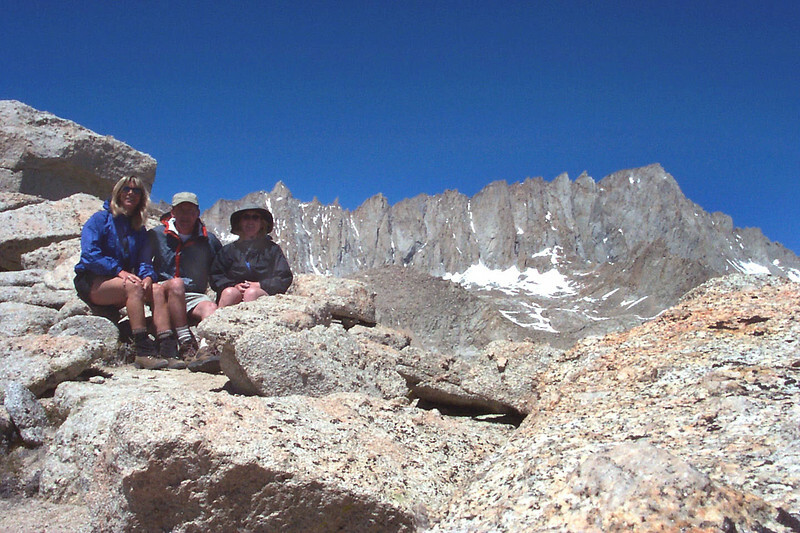 Mount Whitney in background. 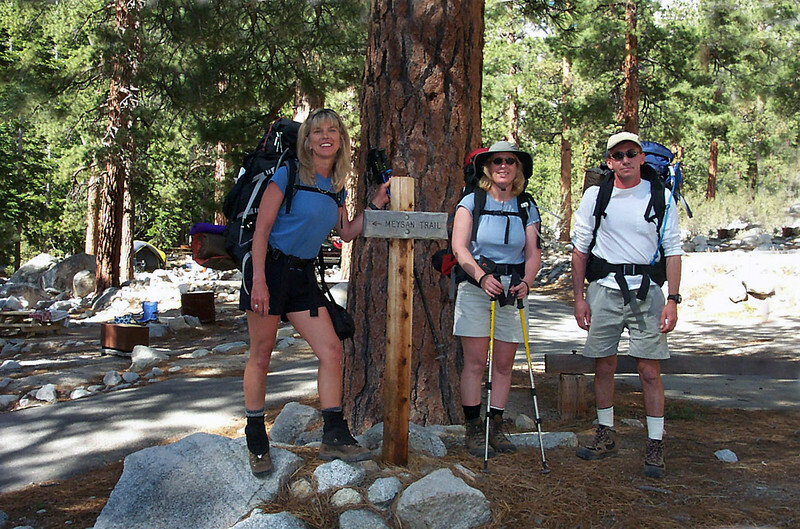 Sooz, Kathy and me in the campground at about 8,000 feet. 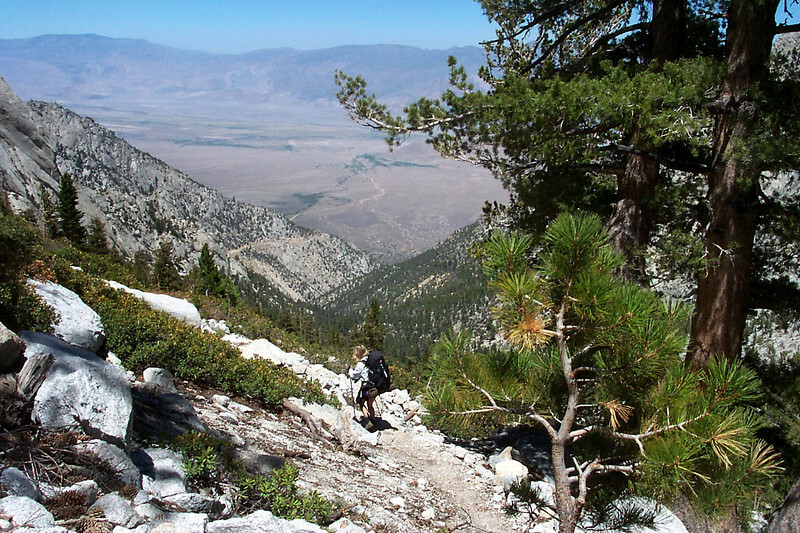 A short way up the trail. 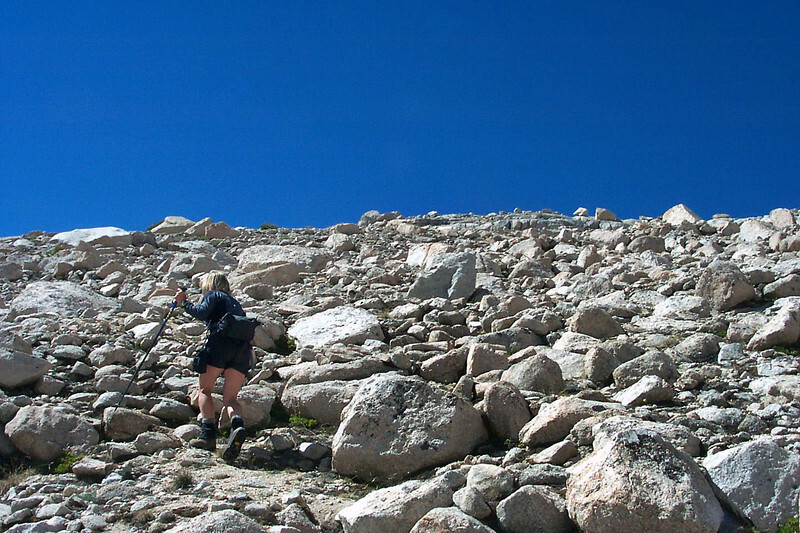 This hike had great views of Lone Pine Peak at 12,944 feet. 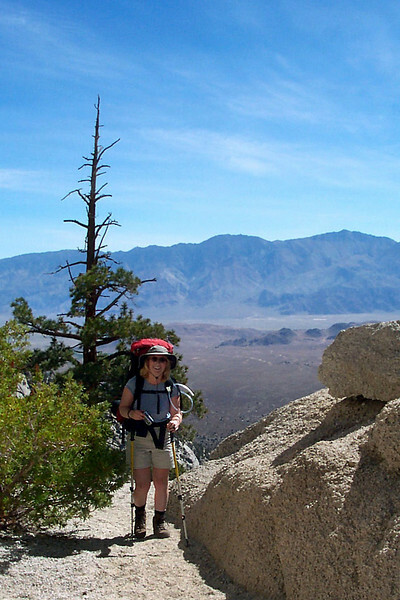 Kathy with the Inyo Mountains across the Owens Valley. 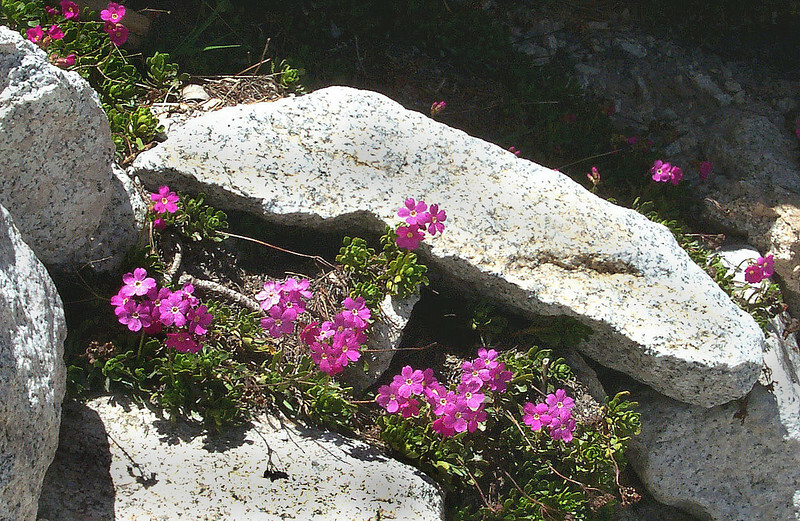 The flowers were just starting to bloom in the area. 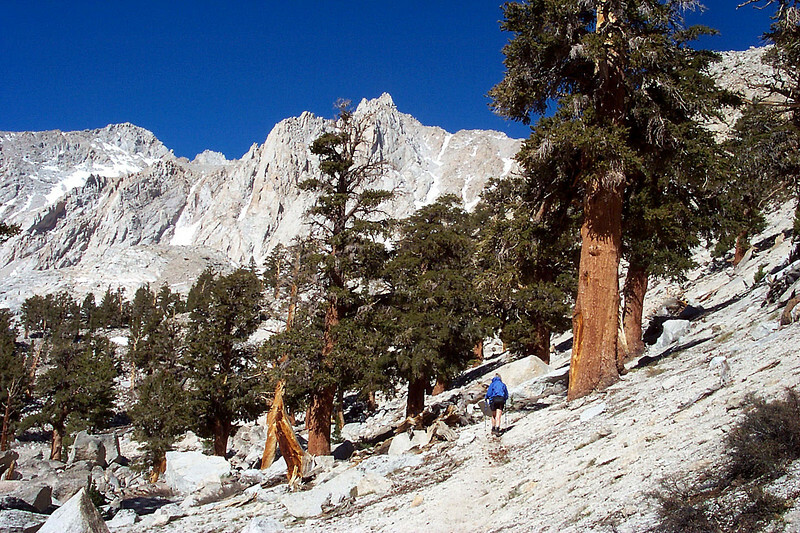 The trees started to thin out above 10,000 feet. 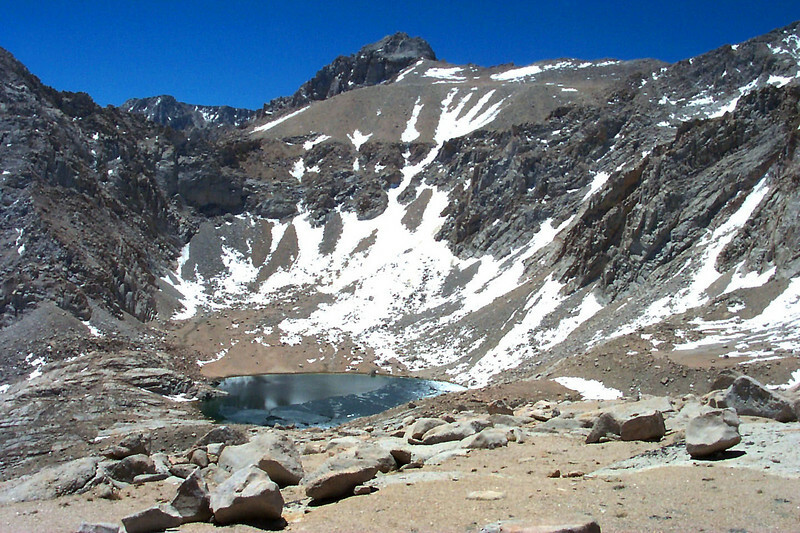 Grass Lake at 10,840 feet. 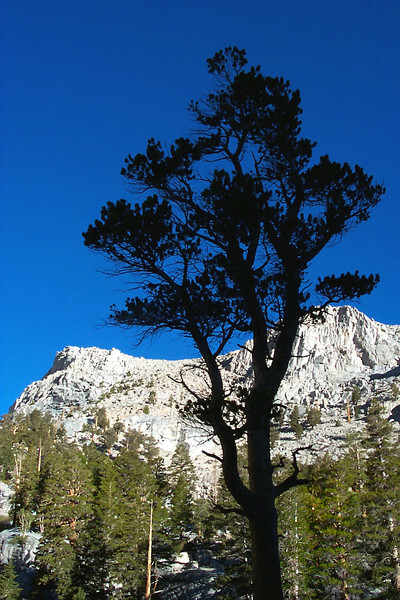 We camped in this area. 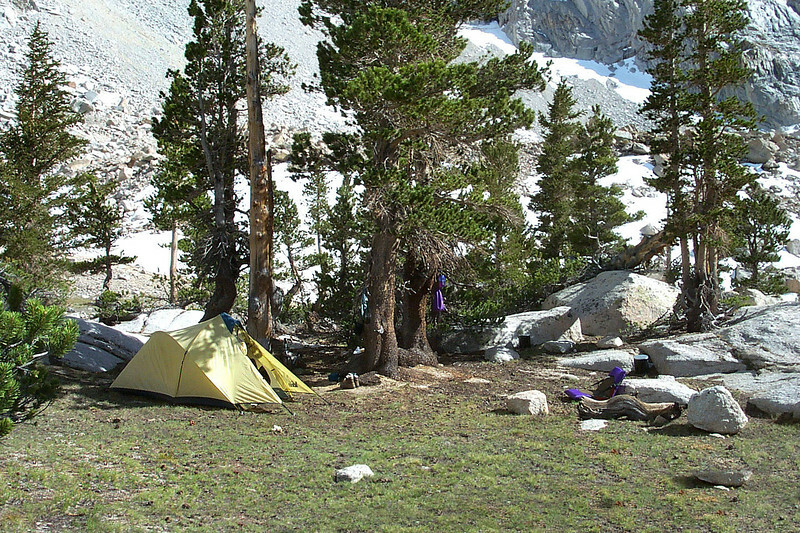 We found a great campsite between Grass and Peanut Lakes. 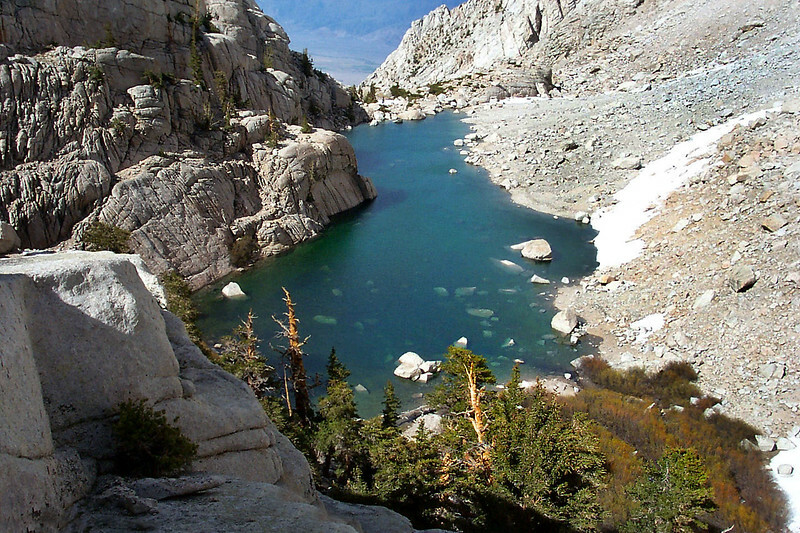 Looking down on Peanut Lake at 10,700 feet from a short distance our campsite. 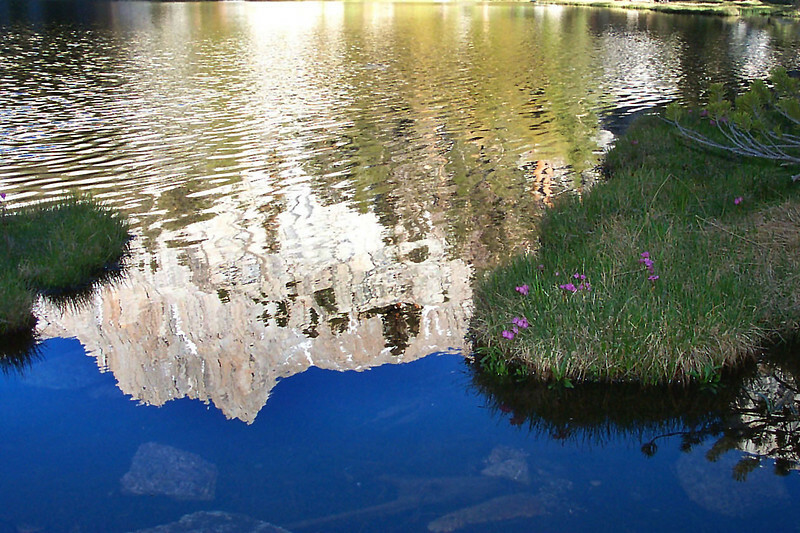 The reflection of Mount Irvine in Grass Lake. 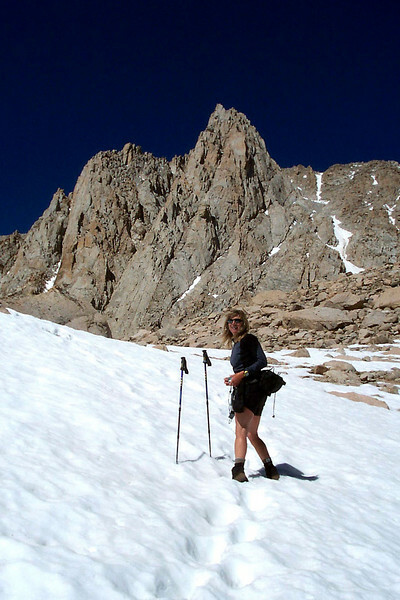 Next morning we packed up and headed back to the trail for a hike up to Meysan Lake. 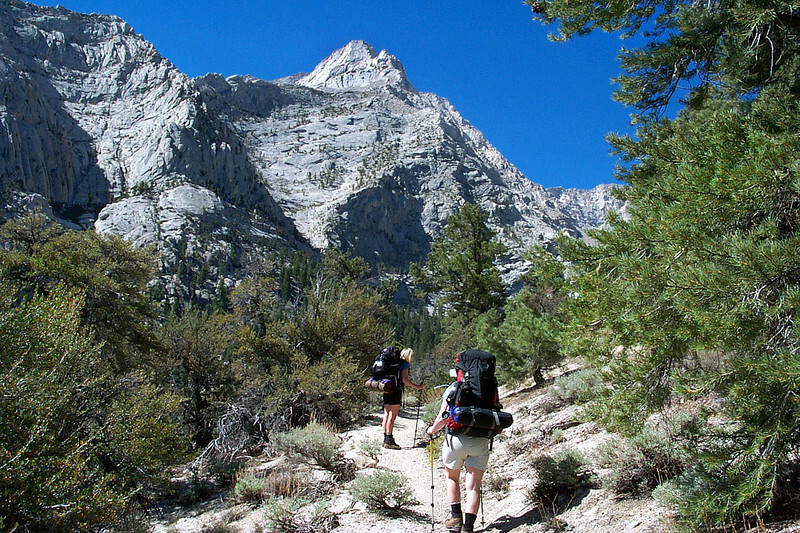 We dropped our packs near the trail and started up towards the lake. 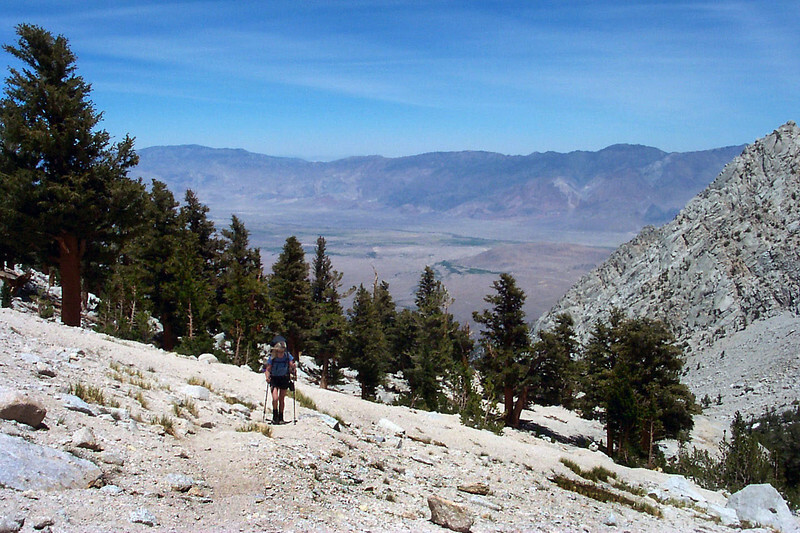 Looking back at the Owens Valley. 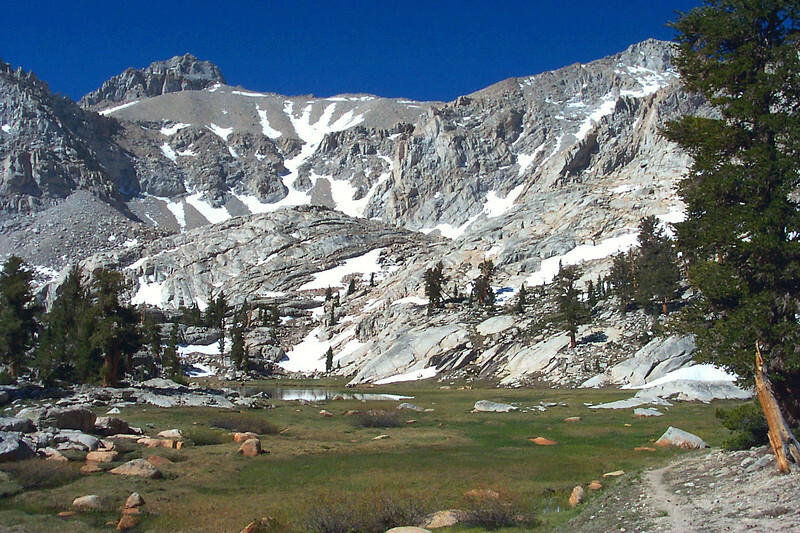 Nice meadow at Camp Lake at 11,100 feet. 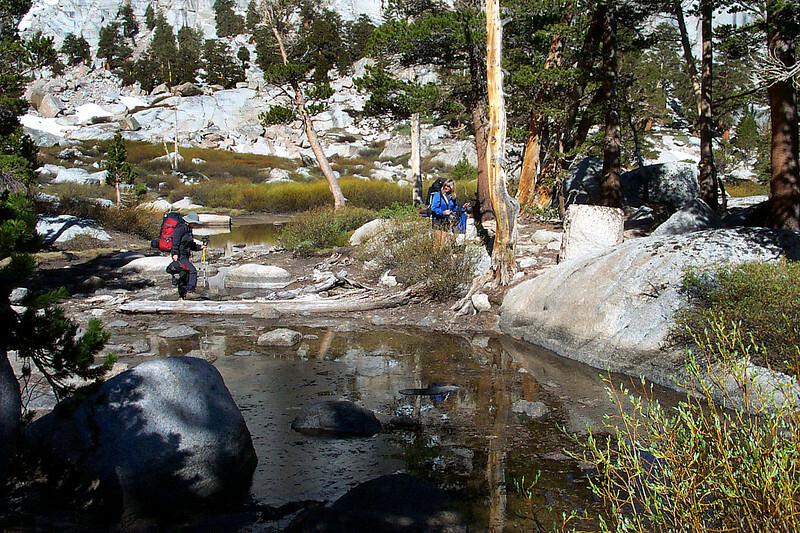 Not much of a trail past Camp Lake. 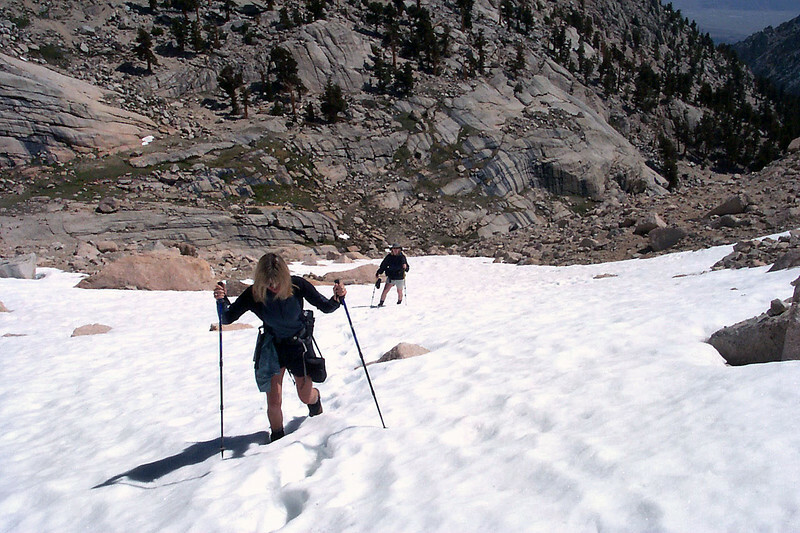 We had to cross a few hundred feet of snow before reaching the lake. 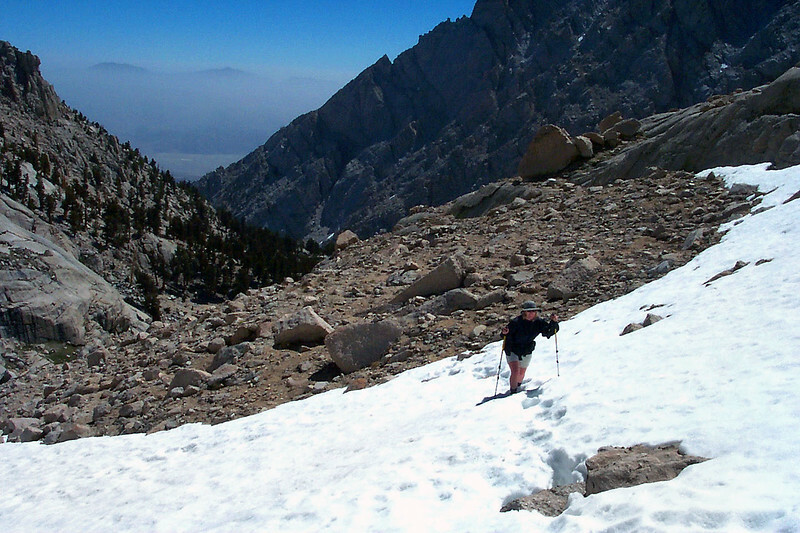 The snow was fairly hard and easy to climb, but was really soft on the way down after being warmed by the sun. 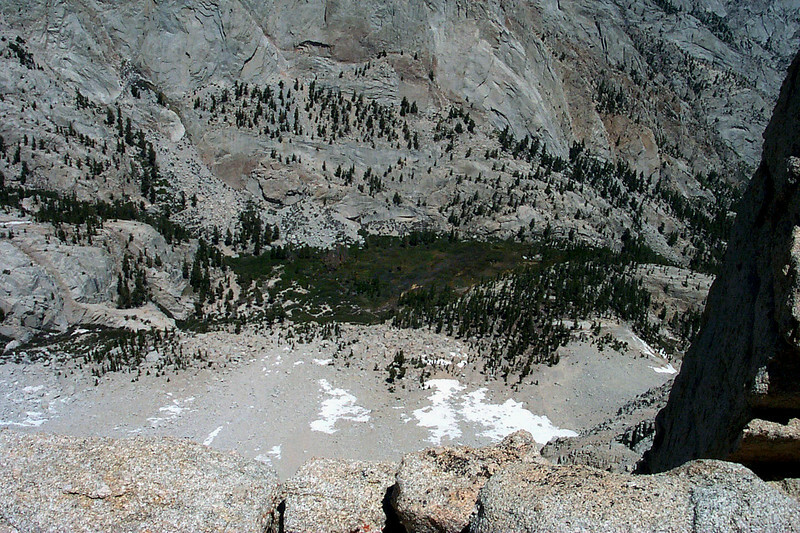 Looking down from the top of the snow patch. 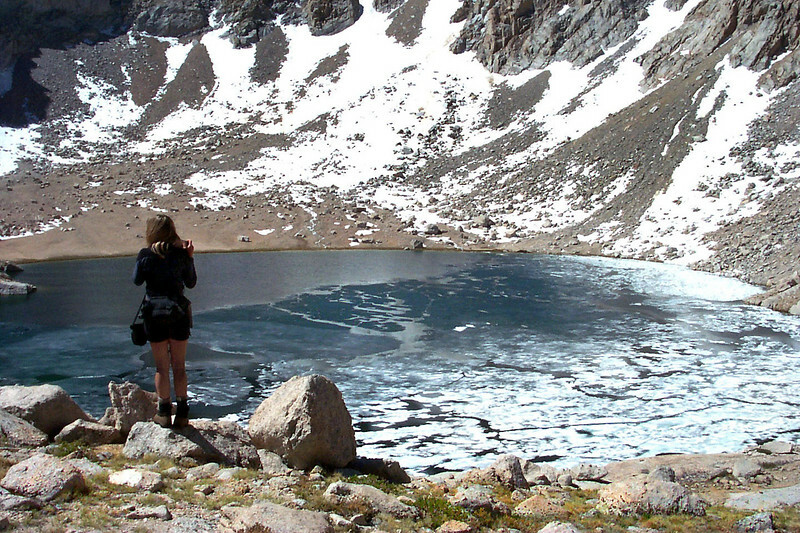 Meysan Lake at 11,450 feet. A large section of the lake was still frozen. 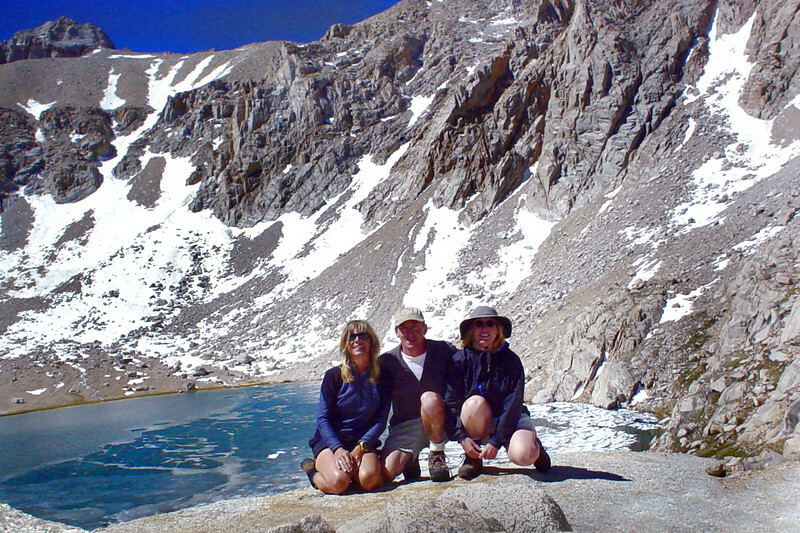 Group shot at Meysan Lake. Sooz talked us into climbing up to this saddle. 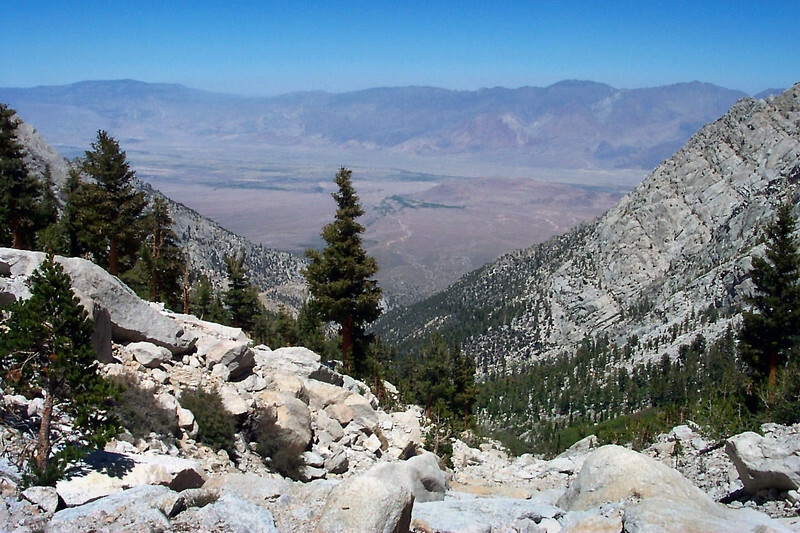 Good thing, the views from there were awesome. 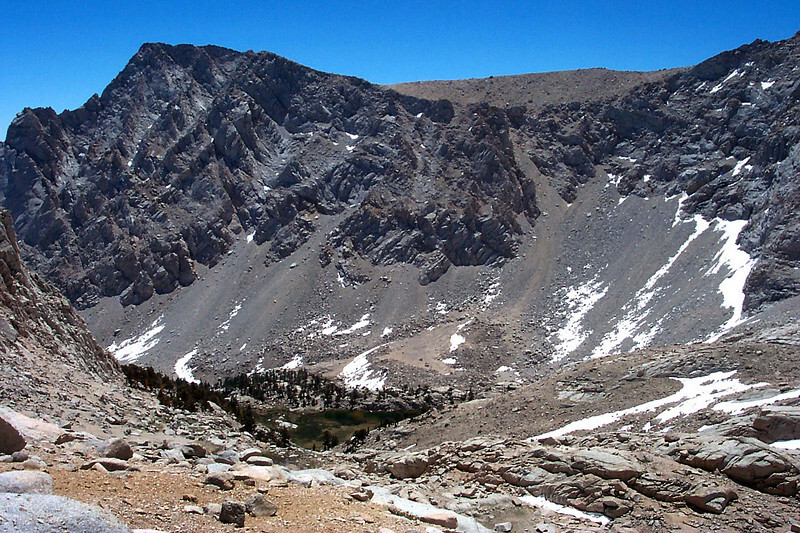 About half way up to the saddle, looking back at Lone Pine Peak at 12,944 feet. 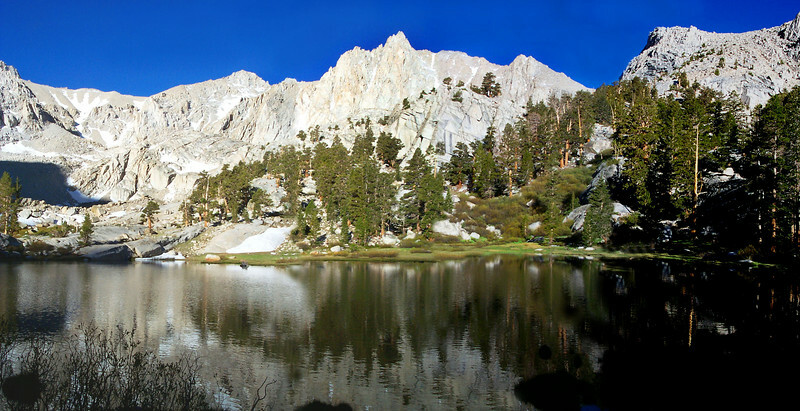 Looking down on Camp Lake. 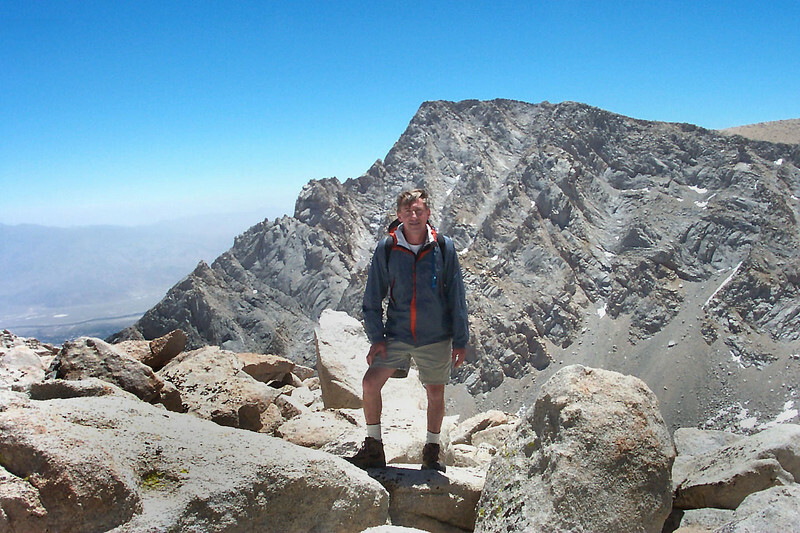 On the saddle at about 12,200 feet. 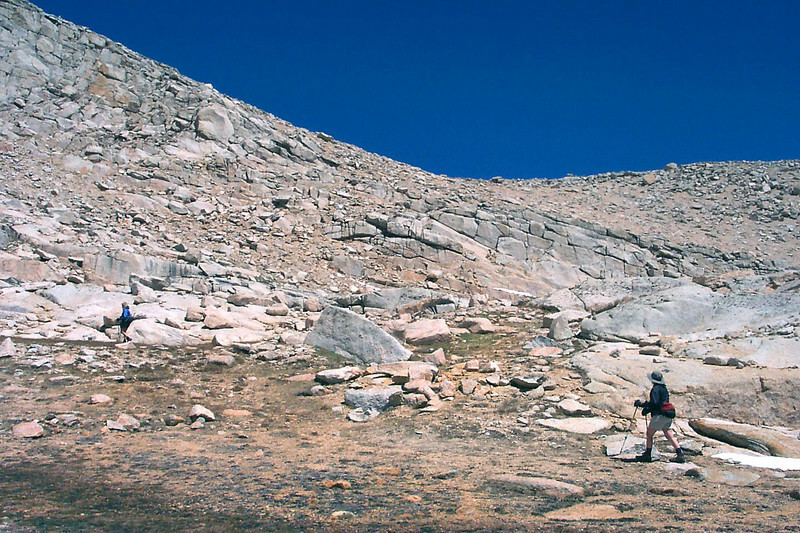 Sooz and I hiked to this small peak to the north for a better view of the Whitney area. 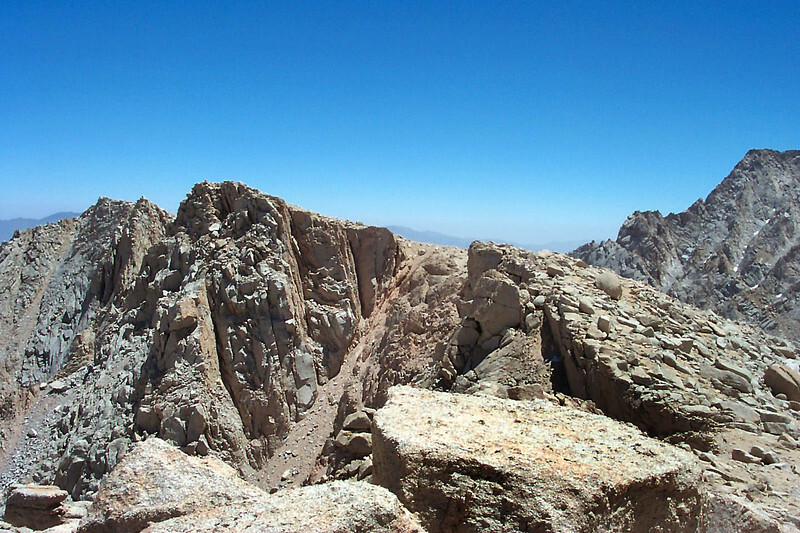 We got a great view of Mount Muir and Mount Whitney. Consultation Lake at lower left. 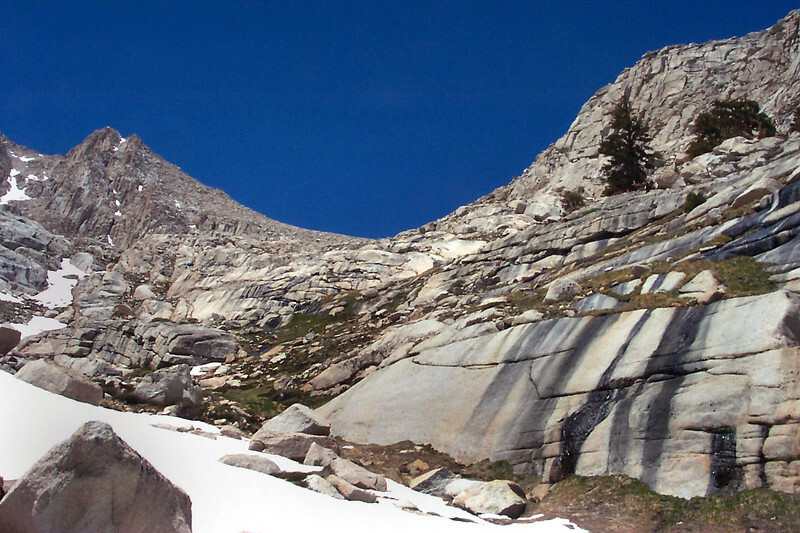 Bighorn Park where Outpost Camp is located on the Whitney Trail. 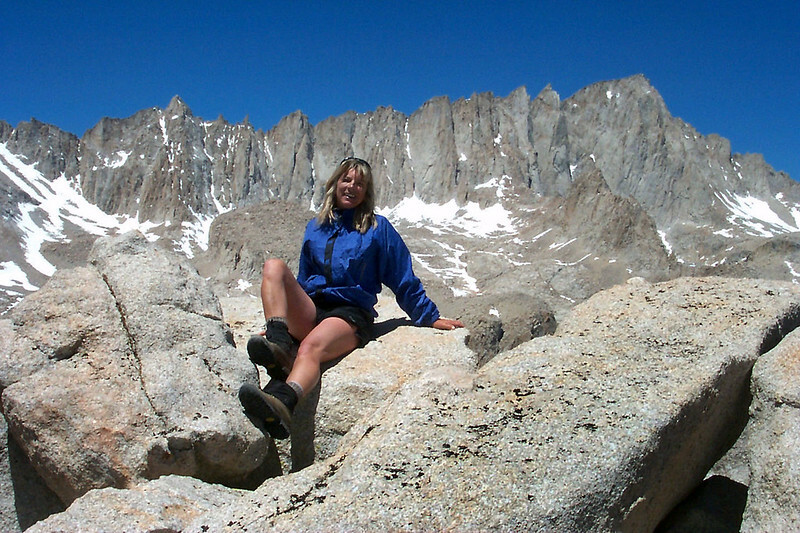 Sooz with Mount Muir at 14,015 feet and Mount Whitney at 14,495 feet to the west. 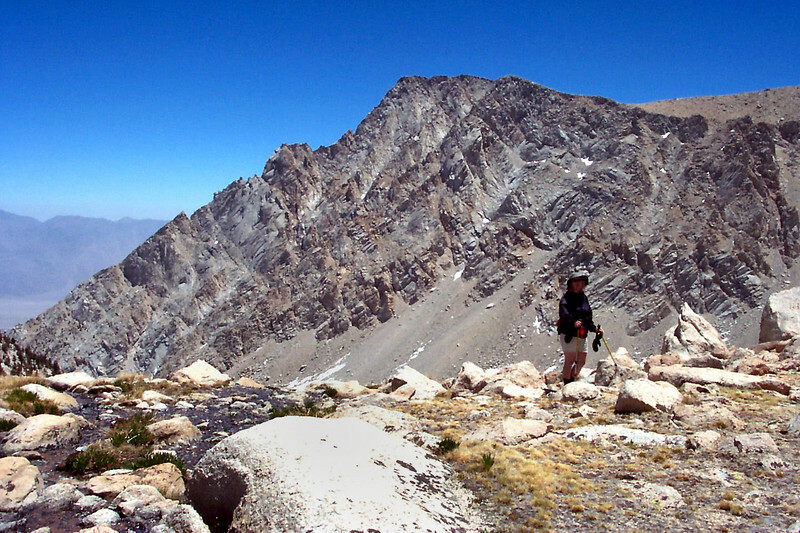 Me with Lone Pine Peak at 12,944 feet to the east. 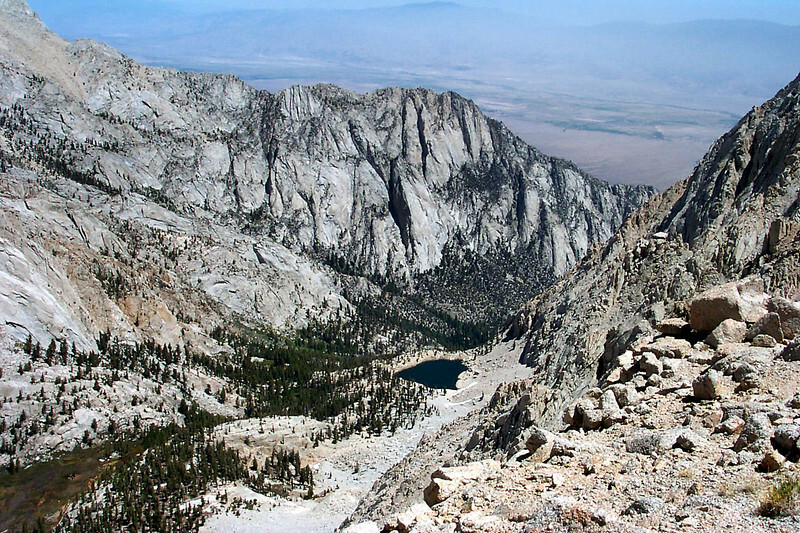 Looking down on Meysan Lake from the saddle. 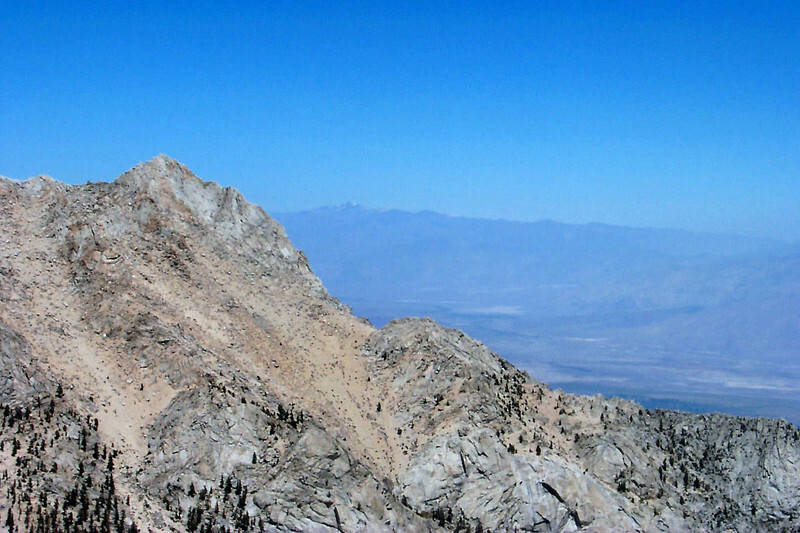 White Mountain at 14,246 feet in the distance arcoss the Owens Valley. 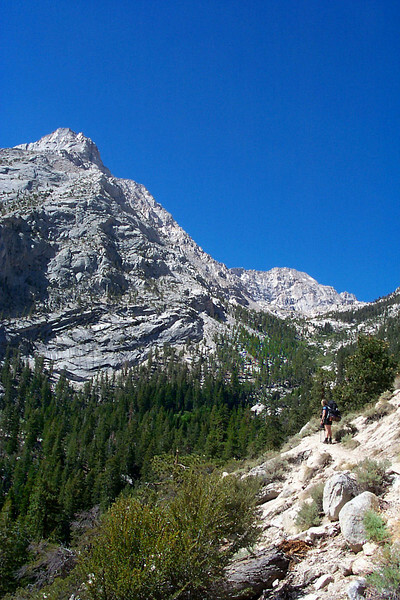 Heading back down to the trailhead. What a great way to spend a weekend.